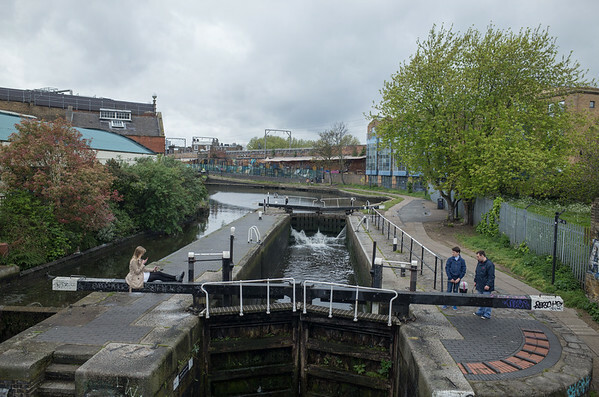 Photographs (2007-2019) of the changing face of Hawley Wharf, adjacent to the Regents Canal and Kentish Town Lock (No 3). 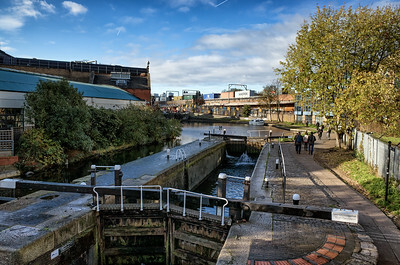 The area is now being redeveloped as Camden Lock Village, with completion expected in the first half of 2019. 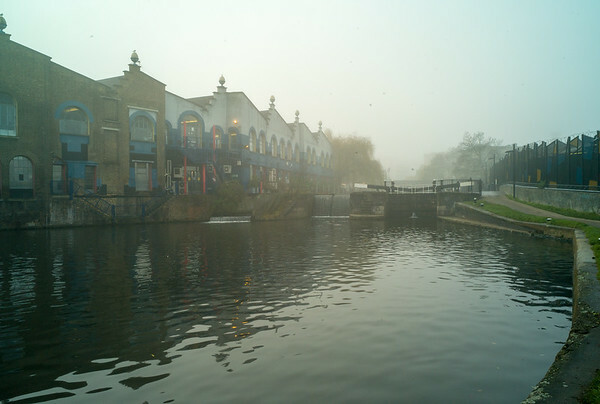 A misty morning at Hawley Lock, with the former Breakfast TV studios in the background - identified by the distinctive egg cups - now the London studios of MTV. 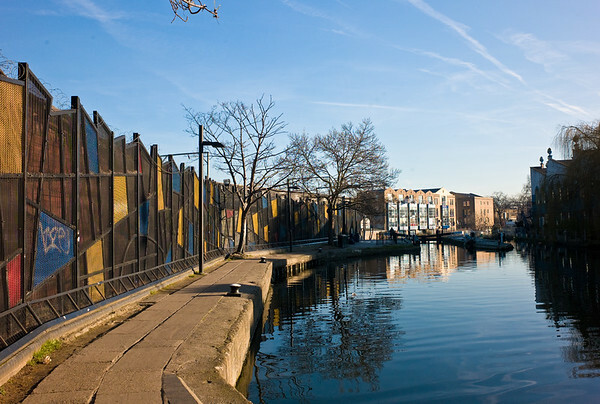 Early spring sun bathes the calm water of the canal basin between between Hampstead Road Lock (Camden Lock) and Kentish Town Lock, with the market fencing on the left. 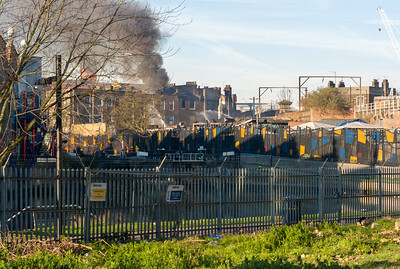 2008 - February 10th - A fire rages in the market and destroys a significant section - including the Hawley Arms public house, which was close to where it started. 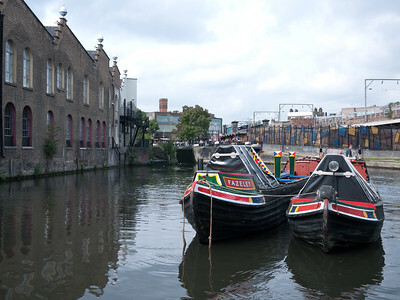 In the late evening of February 9th 2008 a fire began in a corner of the market in Camden Lock Village with devastating consequences. 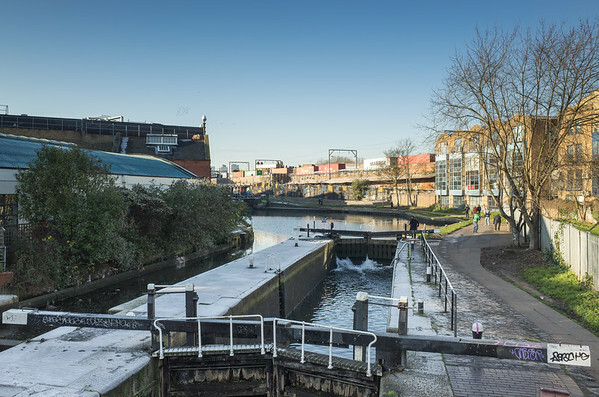 It gutted most of the market and also badly damaged the Hawley Arms Public house - made famous by many Camden based musicians, including Amy Winehouse. 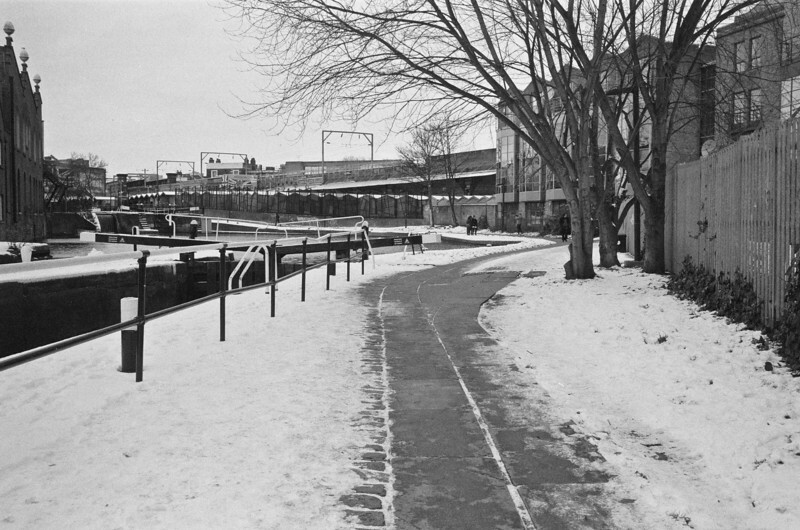 The market was rebuilt but already time was running out for its future at the site. 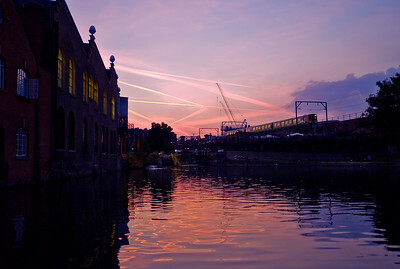 Vapour trails of aircraft landing at Heathrow Airport in the west of London are back lit by the setting sun, casting a warm glow over the lock. 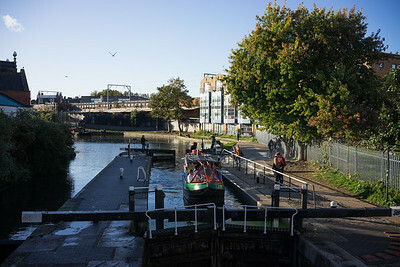 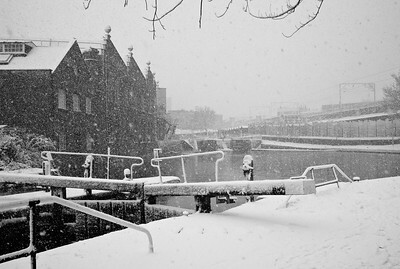 A similar photograph of lock and basin taken late afternoon in October 2008. 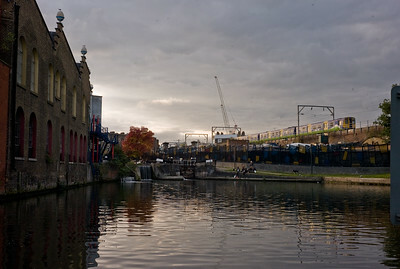 A crane in the background is involved in rebuilding the damaged Camden Lock Village market. 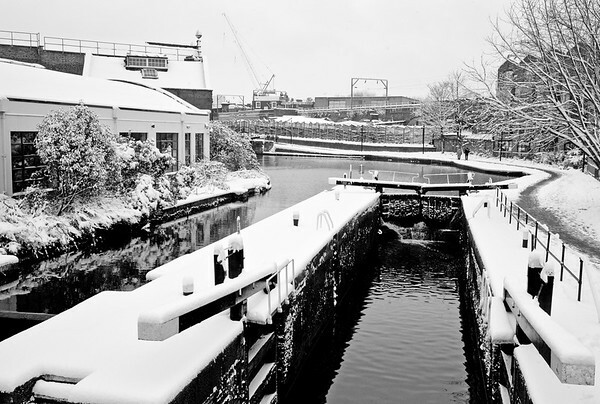 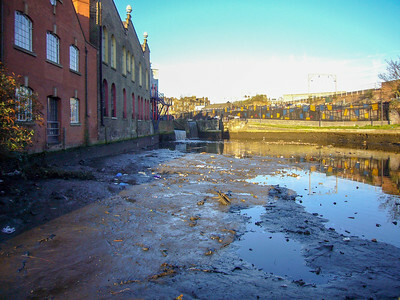 A typical view of the lock and basin prior to its redevelopment. 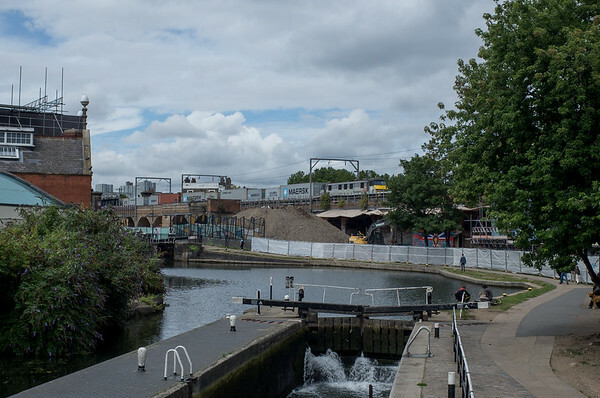 Very noticeable is the viaduct carrying passenger and freight traffic to along the track to Camden Road station, and beyond. 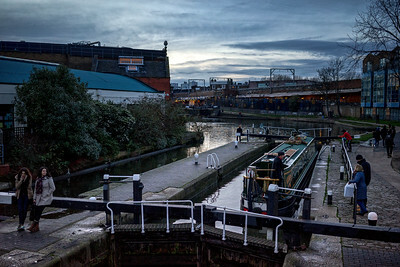 2014 - January - "Last Lock Tonight"
2014 - January - "Just big enough..."
Approximately the size of two canal barges side by side I watched this boat on its journey through Camden Town one Sunday morning. 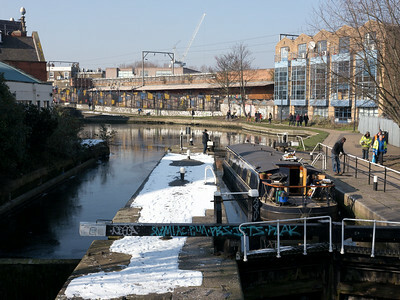 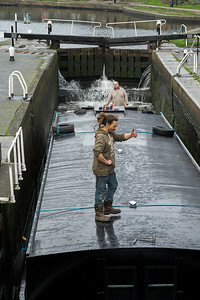 It was on its way ot be fitted out as a houseboat in shipyard further along Regents Canal. 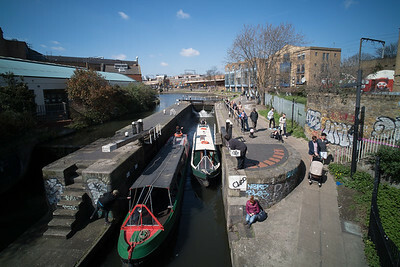 One of the largest bargest I've ever seen coming through the Kentish Town lock. 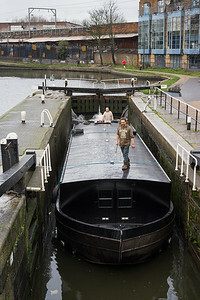 The vessel has been purchased as a floating home and is on its way to a boatyard to be fitted out. 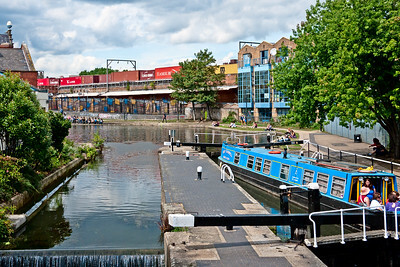 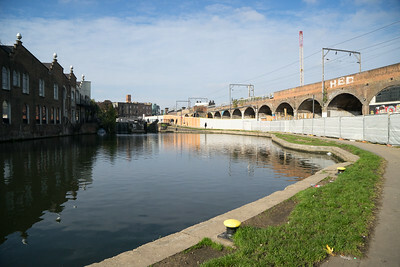 Taken shortly before the works began on Camden Lock Village in 2015. 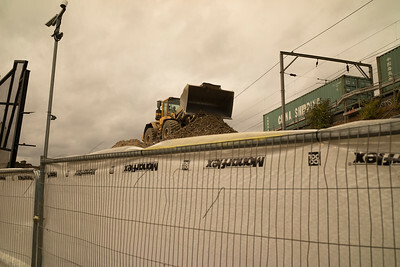 The hoardings go up around the site as construction work commences.